Legions of fans from Boston to Buenos Aires can recite the story of the child born Kal-El, scion of the doomed planet Krypton, who was rocketed to Earth as an infant, raised by humble Kansas farmers, and rechristened Clark Kent. Known to law-abiders and evildoers alike as Superman, he was destined to become the invincible champion of all that is good and just--and a star in every medium from comic books and comic strips to radio, TV, and film. But behind the high-flying legend lies a true-to-life saga every bit as compelling, one that begins not in the far reaches of outer space but in the middle of America's heartland. During the depths of the Great Depression, Jerry Siegel was a shy, awkward teenager in Cleveland. Raised on adventure tales and robbed of his father at a young age, Jerry dreamed of a hero for a boy and a world that desperately needed one. Together with neighborhood chum and kindred spirit Joe Shuster, young Siegel conjured a human-sized god who was everything his creators yearned to be: handsome, stalwart, and brave, able to protect the innocent, punish the wicked, save the day, and win the girl. 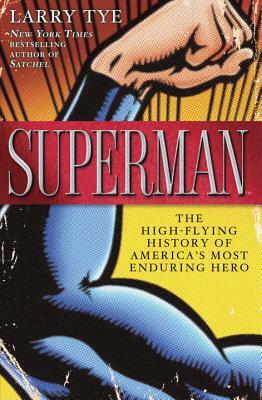 It was on Superman's muscle-bound back that the comic book and the very idea of the superhero took flight. Tye chronicles the adventures of the men and women who kept Siegel and Shuster's "Man of Tomorrow" aloft and vitally alive through seven decades and counting. Here are the savvy publishers and visionary writers and artists of comics' Golden Age who ushered the red-and-blue-clad titan through changing eras and evolving incarnations; and the actors--including George Reeves and Christopher Reeve--who brought the Man of Steel to life on screen, only to succumb themselves to all-too-human tragedy in the mortal world. Here too is the poignant and compelling history of Siegel and Shuster's lifelong struggle for the recognition and rewards rightly due to the architects of a genuine cultural phenomenon. From two-fisted crimebuster to Uber-patriot, social crusader to spiritual savior, Superman--perhaps like no other mythical character before or since--has evolved in a way that offers a Rorschach test of his times and our aspirations. In this deftly realized appreciation, Larry Tye reveals a portrait of America over seventy years through the lens of that otherworldly hero who continues to embody our best selves. "Powerful . . . wonderfully readable." --"The Plain Dealer"
"A story as American as Superman himself . . . The best origin story pulsing through "Superman" is not the one about the Krypton-to-Kansas alien baby, but rather the one about the superhero's mortal and sometimes star-crossed creators." --"The Washington Post"
"Fun, enlightening pop-cultural history." --"Kirkus Reviews"
" A] comprehensive, definitive history."" --Publishers Weekly. Larry Tye was an award-winning journalist at "The Boston Globe" and a Nieman Fellow at Harvard University. A lifelong Superman fan, Tye now runs a Boston-based training program for medical journalists. He is the author of the "New York Times" bestseller "Satchel, " as well as "The Father of Spin, Home Lands, "and" Rising from the Rails, "and co-author, with Kitty Dukakis, of "Shock." He lives in Lexington, Massachusetts, and is currently writing a biography of Robert F. Kennedy.